These are actually not our dishes……. *Notes: Ghibli Museum Website, the animation and art museum of Hayao Miyazaki’s Studio Ghibli (responsible for such movies as Princess Mononoke, Spirited Away, My Neighbor Totoro), from Mitaka Station take the bus from Stop #9 (300 Yen for round trip fare), tickets to the museum can only be purchased at Lawson stores in Japan or at certain travel agencies outside of Japan, English menus are available at The Straw Hat Cafe, almost all ingredients come from organic farms. By the time we’d finished inspecting the Ghibli Museum from top to bottom, M and I were very, very hungry. It was already fairly late in the afternoon and we hadn’t eaten since our ekibens on the train much earlier in the day. 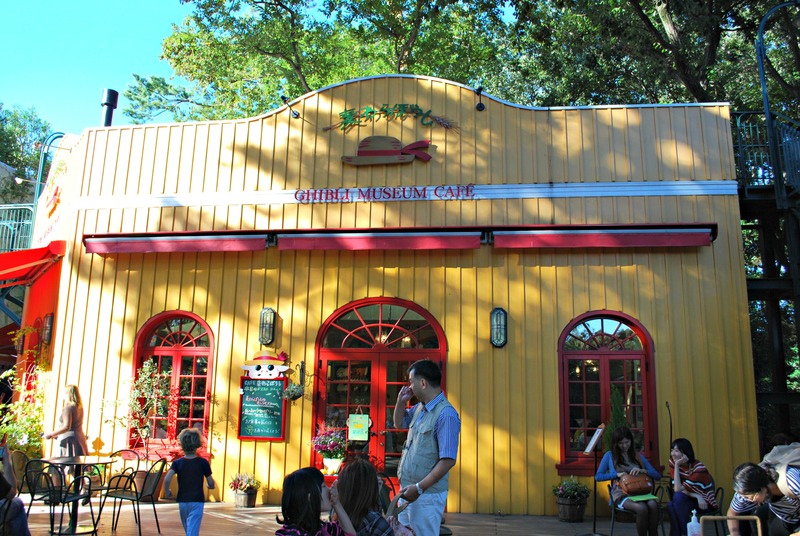 Luckily for us, the museum has the very charming Straw Hat Cafe on its premises that is only open to museum-goers. Unluckily for us, the cafe was completely full by the time we arrived and there was a fairly long line outside. But as I’d heard that the restaurant featured touches of Studio Ghibli’s characters in its dishes and decor, I was absolutely willing to wait for a table. And it was as nice a wait as one could have when they are absolutely starving. 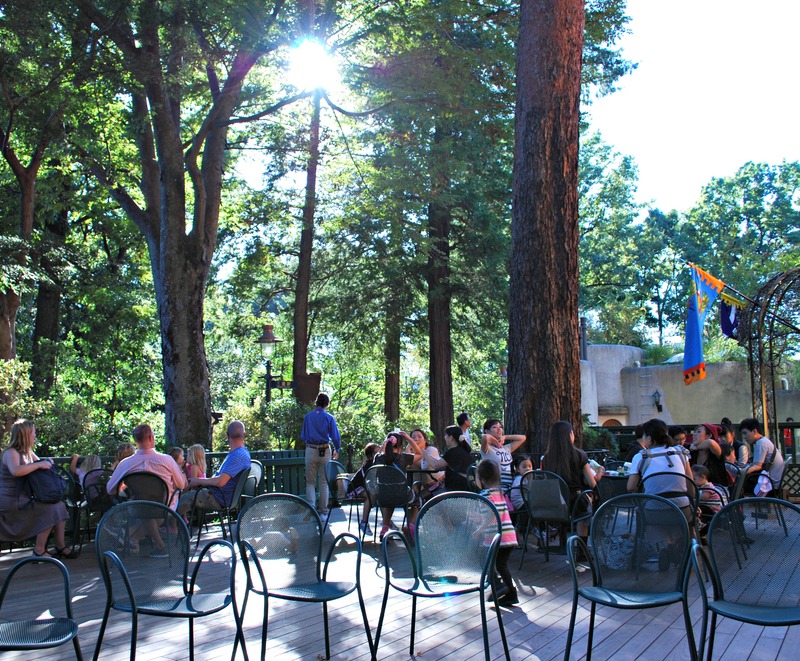 There was a lovely patio area directly in front of the restaurant with tall trees providing a much needed canopy from the hot sun. Not to mention a number of chairs scattered about so we wouldn’t have to stand while waiting. Soon after M and I sat down, a restaurant worker emerged from inside and gave us menus to look at. 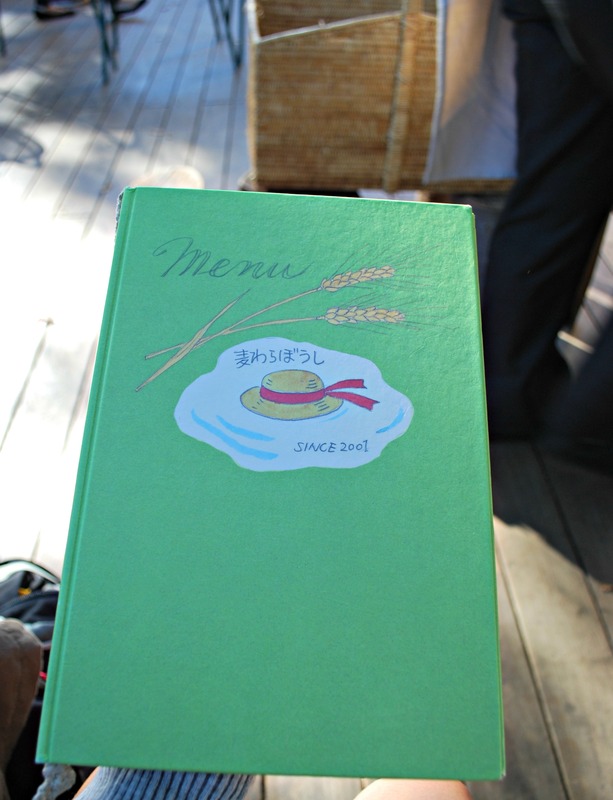 As I opened it, I was surprised and quite charmed by the fact that the menu was handwritten. Although my Japanese reading skills are quite poor, I was able to make out parts of it and was excited to see that they had clam chowder! 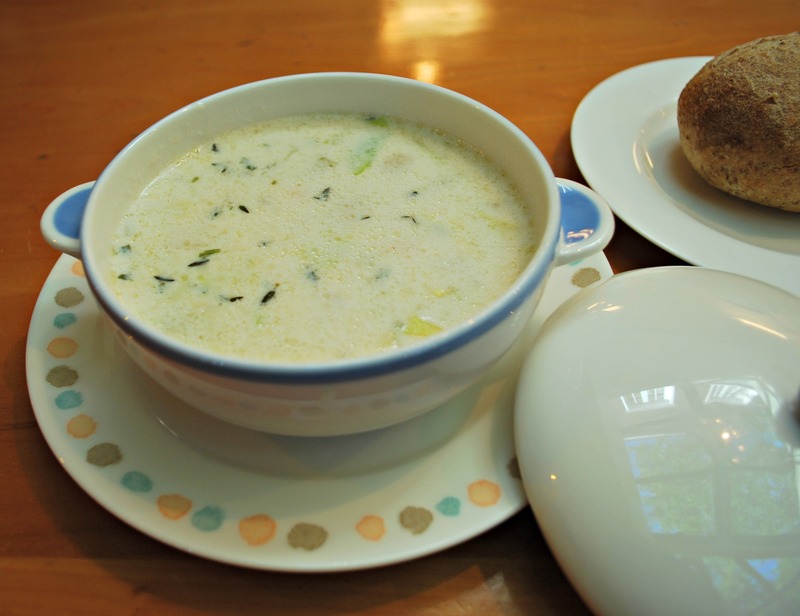 This is one of my favorite soups and it was the first time I had come across it on this trip. So I knew right away what I would be having for lunch. M hemmed and hawed over whether to get the katsu (pork cutlet) sandwich or omurice. I reminded him that we’d had omurice just a few days ago so he decided that he would order the sandwich. Finally, finally, we were summoned by the same restaurant worker who had given us the menus and led in to the restaurant. We were given seats at the counter which pleased us since we could see some of the activity within the kitchen. The counter was only big enough for 4 people, so besides M and I, there were two teenage girls to the left of us. They spoke Chinese throughout their lunch and were giggly and excited throughout. Before ordering, I asked the server if the restaurant had an English menu. I had to double check that my translation of the Japanese menu had been correct! They promptly brought one out and after a quick perusal of it, we decided to go with our initial choices of clam chowder and katsu sandwich. M got a ginger ale to drink and we also put in our order for dessert: strawberry short cake. Then when our food arrived, I was momentarily saddened. My plates didn’t have any Studio Ghibli decorations on it, nor did I get a flag in my little bun. M promptly gave me the one from his katsu sandwich which did cheer me up. And it was nice to be eating clam chowder again as it had been ever so long since I’d had any. 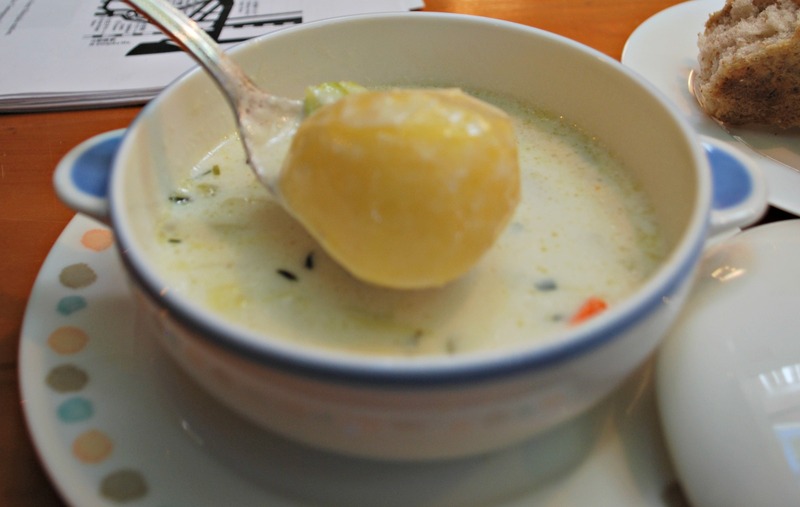 There was also a very large chunk of potato in my soup and it really filled me up. 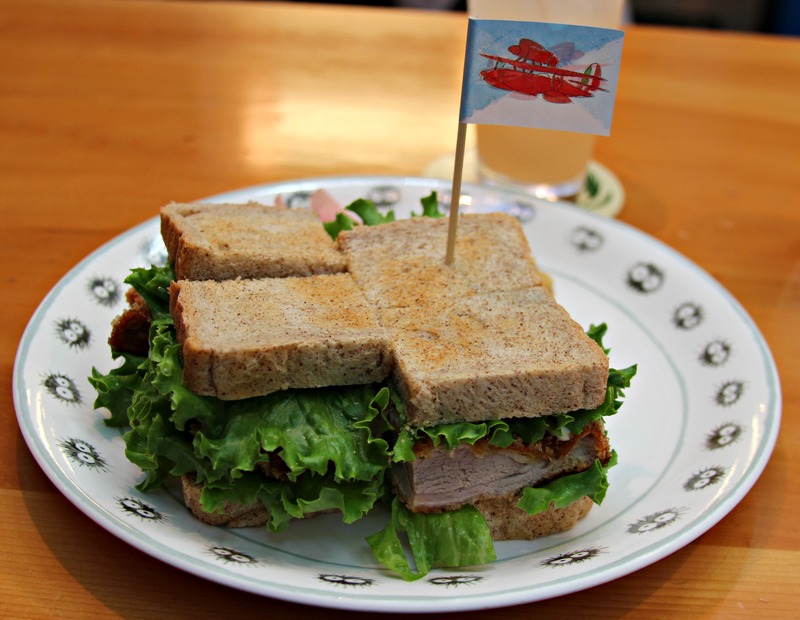 I had a bite of the katsu sandwich which turned out to be quite tasty and the pork was nice and juicy. After we’d polished off our entrees, M and I were served our strawberry short cake. 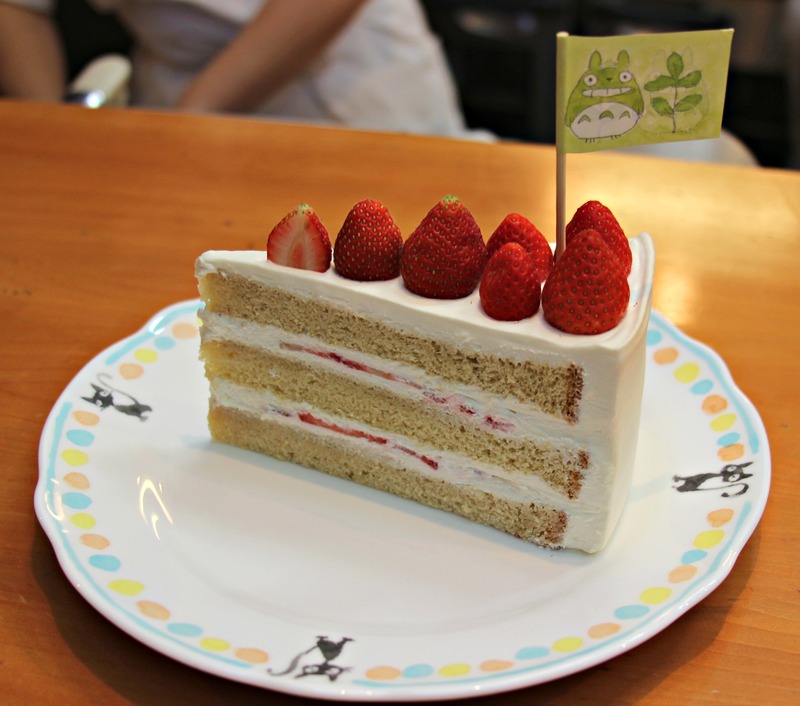 It was a very large slice topped with a number of juicy, sweet strawberries and a Totoro flag. The girls next to us had ordered parfaits and once again, I snuck a picture while they weren’t looking….. 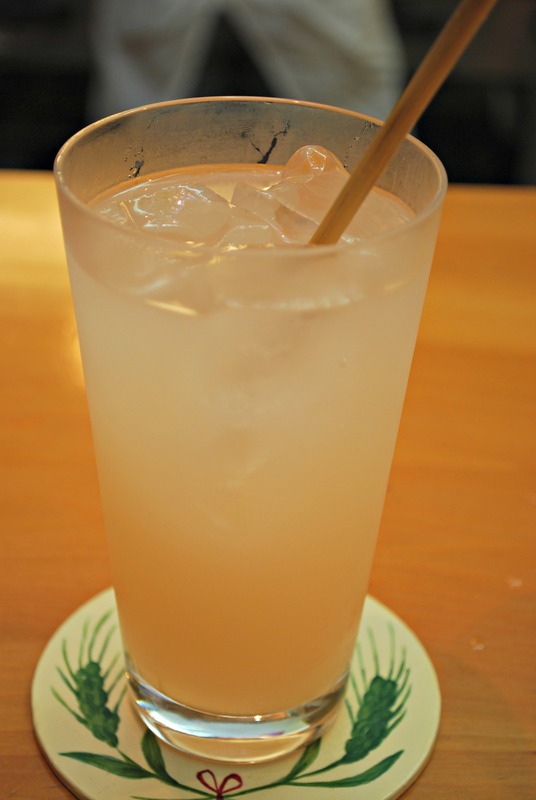 Strongest ginger ale I’ve ever drank, you could really taste the ginger. Check out that monster potato…. After enjoying our dessert (we practically inhaled that thing! ), we paid the bill at the front and set out towards the museum’s exit. 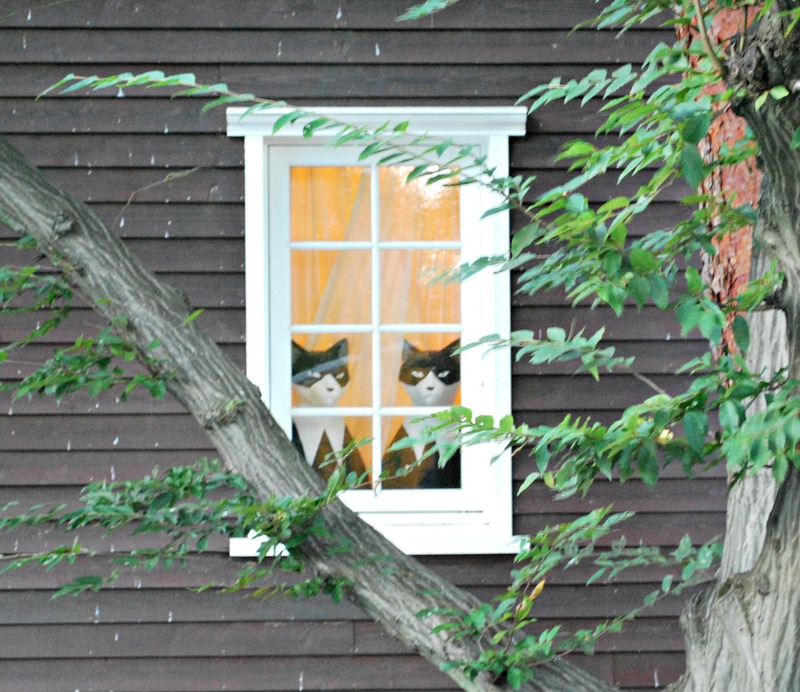 As we passed the building right next to the cafe, we saw a small group of people pointing to the window and saying, “Look at the cats!” Thinking that they meant real cats, I gave the window a cursory glance but did a double take as I realized there were 2 large cat figurines in the window. They appeared to be glaring at us in the way that only cats can and they really brought a smile to my face. What a cute place, those desserts look insanely good! The strawberry cake was wonderful! At first I was a little taken aback by the light brown color of the cake layers (looked a bit like whole wheat bread!) but then I remembered that the restaurant was working with all organic ingredients. Next time I will definitely go for the parfait! Thank you! How exciting to be in Tokyo for XMAS! The decorations must be wonderful, I am already looking forward to your posts from that trip! Reblogged this on Miami Swamp . Thank you very, very much for reblogging this post! We loved our visit there as well! Eating at the cafe was worth the wait but I would definitely order differently if I could do it all over again. Omurice and a chocolate parfait! The Japanese menu looks lovely! I loved how it was all written by hand! I only got to see 2 menus so I’m not sure if they were all done by the same person but, if so, that would have taken them hours. I’m a pretty big fan of the studio! It must have been wonderful to have the complete Shibli experience! Love the post and would take note if I were to visit Tokyo. The museum was wonderful! I wish they had let us take pictures inside but it wasn’t allowed. Many of the exhibits were interactive and there were so many nooks and crannies to explore. One of the best parts was a short movie that was shown in their little theater. These movies are not available anywhere else so it was a very special experience. I hope you will be able to go someday! I wish I had that piggy writing board. It would be fun to use it to leave message (just like the one in Japanese stations!) L-O-L! Oh I know, the cake was cut very neatly, they must have used a very sharp knife. And yes, I also wish I had the piggy writing board. I would hang it up in the kitchen and write the day’s menu on it. Too bad it would probably just say really simple stuff like scrambled eggs for breakfast and leftovers for dinner. But I would serve it all on those Totoro plates I saw in the cafe lol! Hahaha, you are so funny, I literally laughed out loud when I read your comment. How could I forget the Totoro flag? 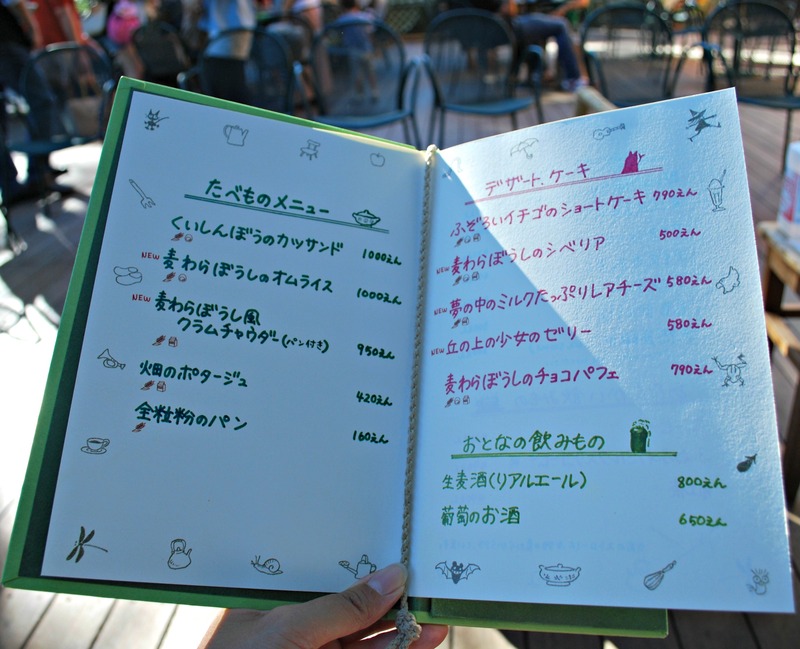 Ghibli Museum was already on the agenda for our Japan trip later in the year but now the cafe is on there too! Looks lovely. 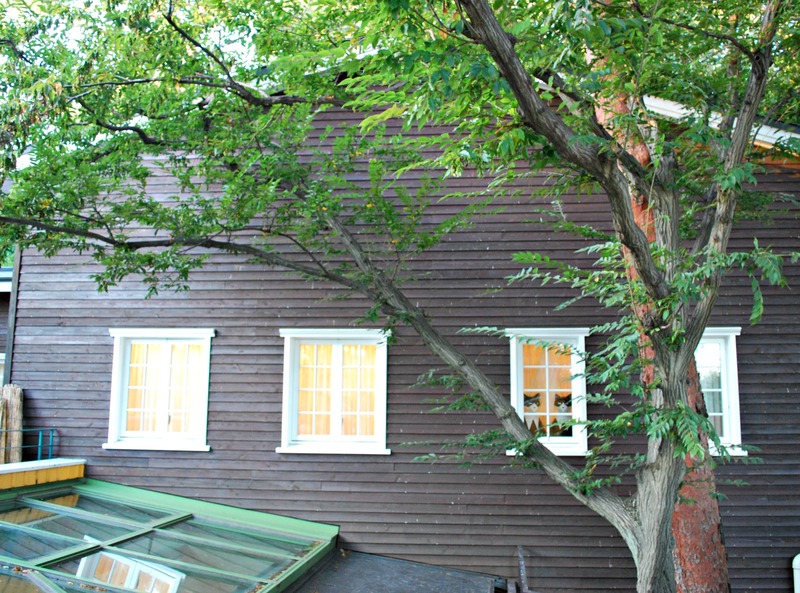 I hope you will enjoy the Ghibli Museum! We had a fabulous time there, the exhibits are wonderful to look at. And they show a short movie in their theater which you can’t miss as it’s only available for viewing there. 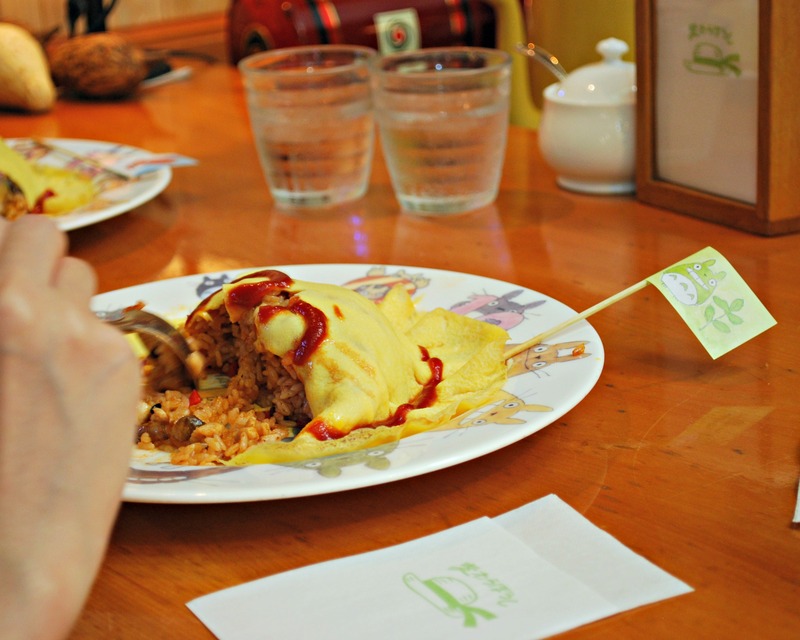 The cafe might have different items by the time you go but if they have the omurice I would recommend it! The last time I’ve been there was… About 7 years ago! Wanna go again now! The cafe was too cute for words, it was the perfect ending to a wonderful visit to the museum. Hopefully you will get to go back again someday soon. never heard about this place before, thanks for sharing! The Ghibli Museum is truly wonderful. If you have watched and enjoyed any of Miyazaki’s movies then the museum is a must. Getting to eat at the cafe was the cherry on top. ah! how cute!!! i wish i had heard of this place prior to my trip, i really enjoy Miyazaki’s films and it would’ve been fun to see them in incorporated into restaurant form. 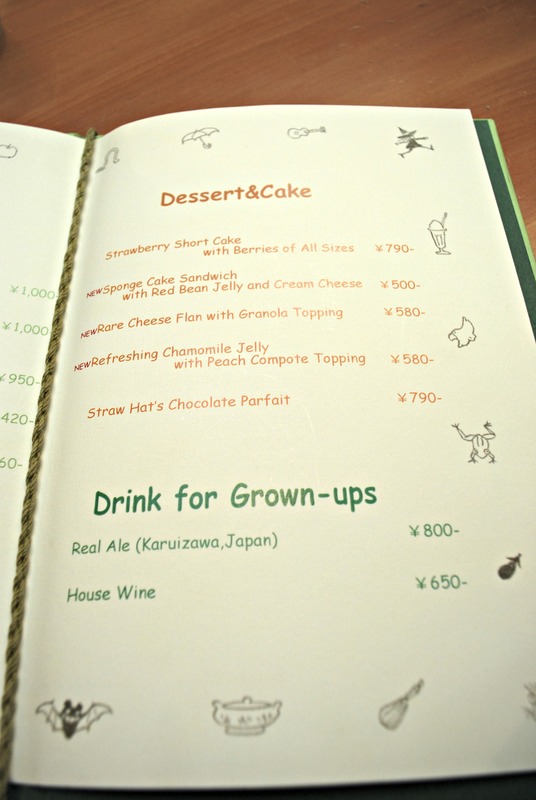 i like how free spirited the writing is on the menu like.. “drink for grownups”. too cute~ ! It took me several trips to Japan to finally make it to the Ghibli Museum. I actually hadn’t heard of it until a couple years ago. Which is strange since I really enjoy watching Miyazaki’s films. 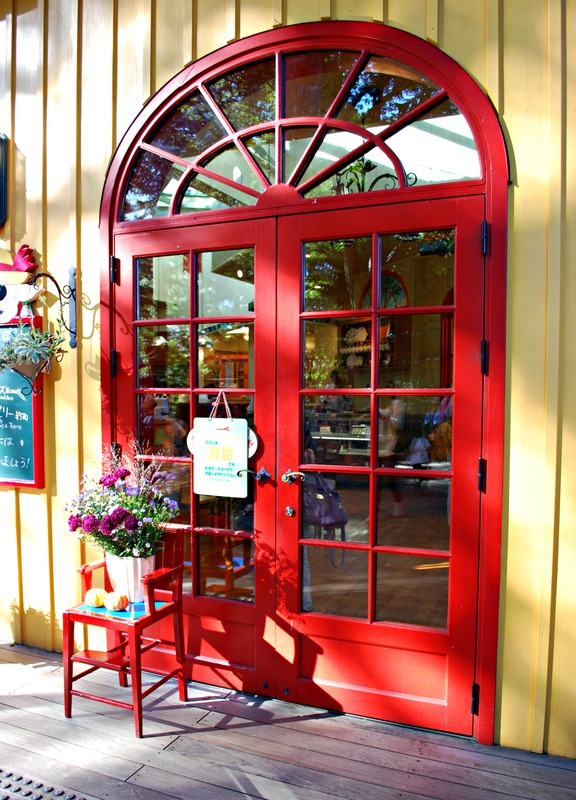 Everything about the cafe was so cute, I hope you’ll be able to make it there someday soon. Your pictures are great! 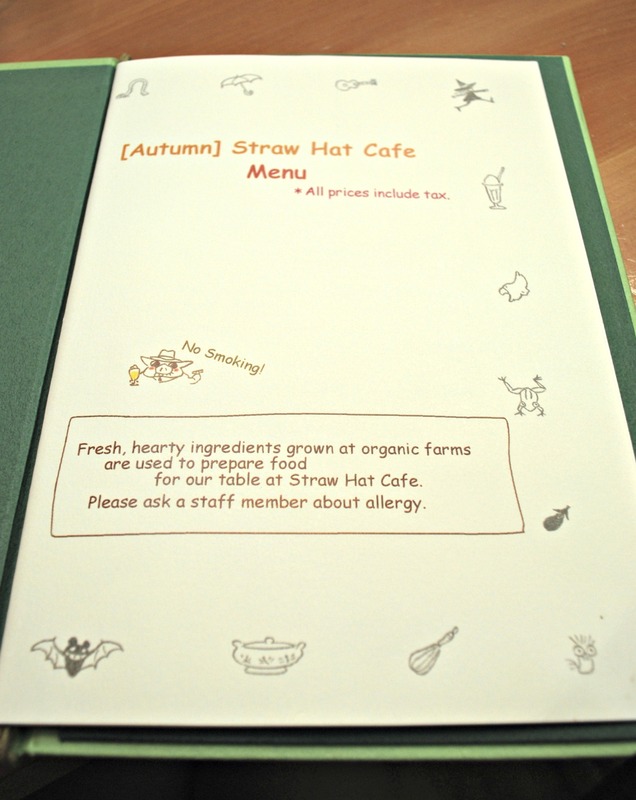 The Straw Hat Cafe looks so cute and endearing; the omurice has such a simple yet adorable concept. It’s my dream to go there someday. I love how there’s that special Ghibli touch everywhere in the museum. Oh that’s too bad! Have you tried getting the tickets before your trip in Singapore? We got ours from our travel agent a month before our trip. The only tricky thing is that you need to specify exactly which day you’re going to go. And once you pick that day you can’t change it. The day we went, we were still in Sendai so we had to wake up really early to catch a train down to Tokyo. Really tiring but it was so worth it. I really hope you will get to go the next time you’re in Tokyo! We thought it was smart to go there after the school holidays but it was still packed. Luckily we only had to wait 10 minutes for the short film. We went on a Friday and it was fairly busy but not as bad I’d feared it would be. We only had to wait around 10 minutes for the movie too. Which one did you get to see? Ours was called “The Day I Raised A Planet”, it was really wonderful. Somehow I missed the cafe, when I was there. It looks like a very nice place. I’m glad you had fun! Yes, we really had a wonderful time at both the cafe and the museum. It makes me want to watch Miyazaki’s films all over again! If memory serves, the café was also completely packed when I was there three years ago. Looking at your pictures, I rather regret not waiting for a seat. I did enjoy the rest of the visit though, so much so that I might swing by for a return trip come February. (Thanks to your post, I’ve already got my order ready should the café draw me in: the omurice, with a parfait for dessert, and maybe a sponge cake sandwich if I’m feeling really peckish.) I’m especially hoping to see another of the short films they regularly screen at the Saturn Theatre: if the website schedule can be relied upon it will be different from the one I saw before. Speaking of the theatre, which title did you happen to catch during your visit? Mine was “Pan-dane to Tamago-hime” (really sweet little film – wish they’d sell a Blu-ray of it). 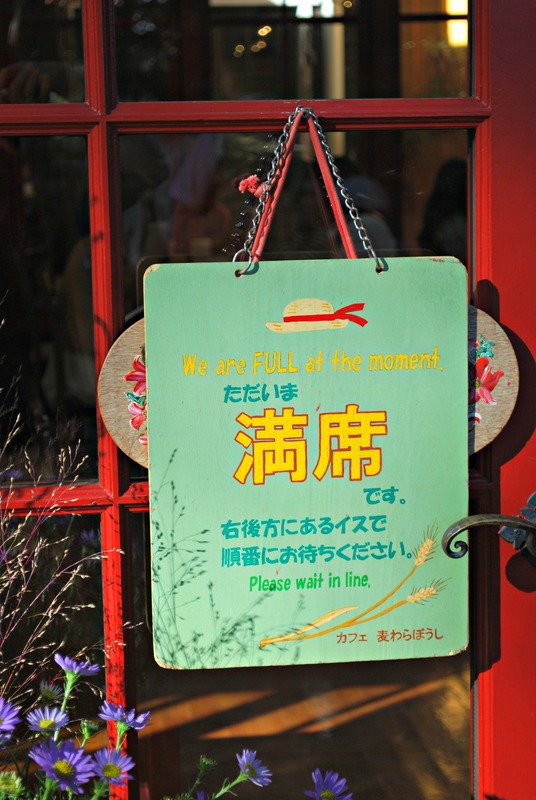 Every blog post I’ve ever read on the Straw Hat Cafe always mentions a wait, I think it’s always busy. A lot of people opted for the little to-go counter located next to the cafe instead. It sounds like you’re also going to Tokyo as part of your February trip, so exciting! I really loved watching the short movie at the museum. The one we got to see was “Hoshi o Katta Hi” (The Day I Raised A Planet). I also wish they’d sell a DVD that features all of the short movies shown at the museum. I’d really like to go back to the museum and watch all of them someday, but I’m not sure if M would care for that idea much. He understands very little Japanese and was unable to really follow along with the movie’s storyline. I wish I could have translated for him while we were watching it but, of course, that was out of the question. That was our first visit to the Ghibli Museum but I’d love to go back again and watch a different short movie. We saw “The Day I Raised A Planet”, it was really wonderful. We’re glad we got a chance to eat at the cafe, it was very much worth the wait. I hope you’ll also enjoy it when you go. Yes, I like their short movies and so does my partner, who did not understand a single word, but he said he was so moved. By the way, we saw “Cho-Zumo”. I just went online to read what Cho-Zumo was about. Mice as sumo wrestlers, sounds very interesting! The short movie we saw was very hard for M to understand since his Japanese language skills are very limited. It’s a shame because he really likes Miyazaki’s movies. But soon “The Wind Rises” will be coming out in theaters here, we can’t wait! PS. The cats look creepy. I know, the omurice did look so good and I could tell the girls next to us were really enjoying it. They both scraped their plates clean! The sad thing is that we will probably never get a chance to eat it even if we go back to the cafe because their menu is constantly changing. Still, it was very nice just to get to go and the strawberry shortcake was delicious. Lol, the cats did look pretty creepy because they had a lifelike quality to them. But it was nice to see them from a distance. I’m so glad to hear that the both of you liked it! I very much agree that it’s more a story about men and love than it is a coming-of-age movie. I was especially touched by the main character’s (Ellis) belief in love and how he feels it can solve all of life’s problems. 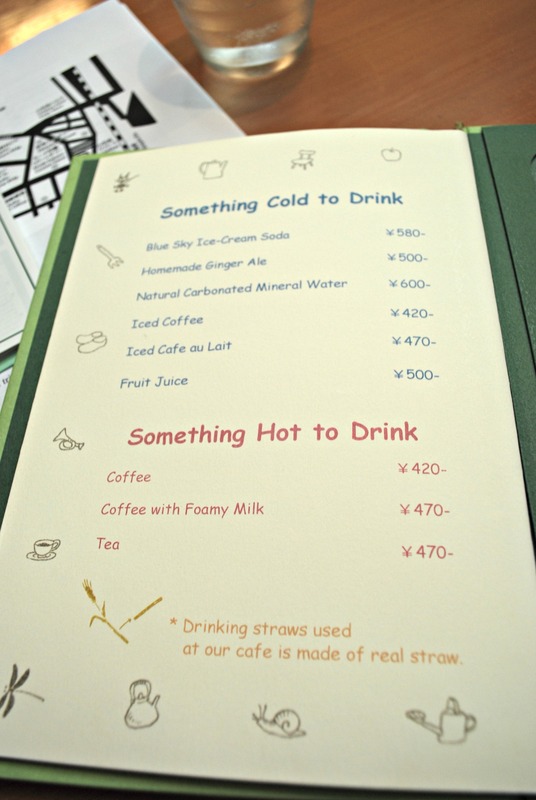 Everything looks so good, and the menus were really cute! I would have probably ordered like 3 coffees just to have loads of pictures of different latte art. As always, gorgeous pictures! Thank you so much! 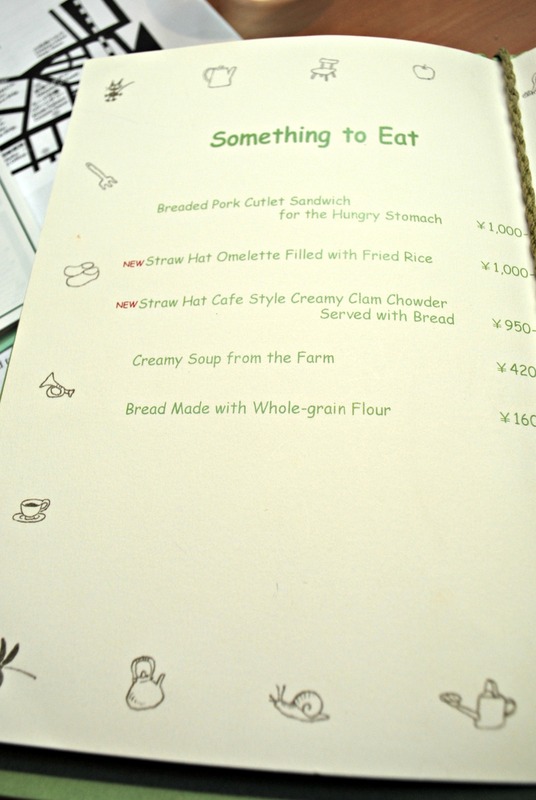 I loved the handwritten Japanese menu and how it looked like a book. 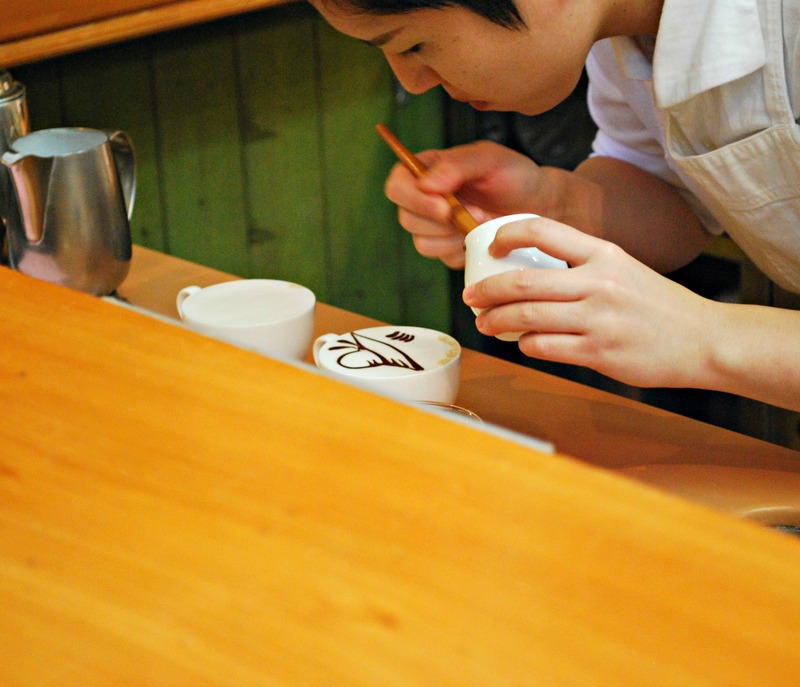 It was fun to sit at the counter and watch the kitchen workers draw the latte art. It’s amazing how quickly they’re able to do it. 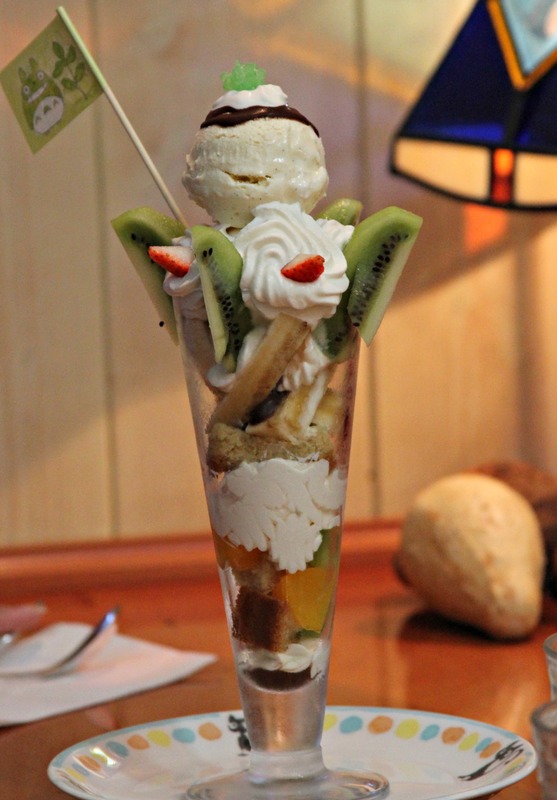 Love the Straw Hat Café! We were there earlier this year and had a curry rice with pork katsu. Very yummy! Oh, curry rice with pork katsu sounds delicious, I love curry! I noticed their menu was seasonal and wondered what other items were served at the cafe. Thanks for letting me know. The “painting” in the coffee, wow amazing. I know, the straw hat they drew on the foam was so cute! And they were able to do it so quickly and perfectly, it was amazing. Studio Ghibli has made animation more than just animation for kids. I love Princess Mononoke and Nausicaã of the Valley of the wind the best. Did you see any exhibits from them? And the cafe looks really cute! I totally agree that Ghibli has brought a level of sophistication to animation. The majority of the people at the museum were adults rather than children. And many of the visitors were foreigners, a testament to how popular Miyazaki’s movies are worldwide. There were definitely exhibits on Princess Mononoke but I don’t really remember any from Nausicaa of the Valley of the Wind. I must have that cake!!! it is so pretty! Strawberry cakes are the best. I’m usually the biggest fan of chocolate stuff but strawberry cake is one of the rare desserts that I will pick over a chocolate one. The strawberry cake at the Straw Hat Cafe was wonderful, I love how they arranged the strawberries on top. I was pretty surprised at the color as well, until you mentioned its organic. Wow, this is such a beautiful post! Every bit of this cafe looks so delightful. The attention to detail is incredible (I really love the handwritten menus). I can see the thoughtfulness, beauty, and wonder of the films is really represented here. And you are such a perfect guide! I would feel the same angst over picking just the right menu items, and I loved your descriptions. The Totoro cake looks so lovely. You really captured the whole experience perfectly. It would be a dream to go here someday. Thank you always for your kind words. Visiting the cafe was a wonderful experience. Maybe too wonderful. Because I was so entranced with the interior, I didn’t notice that almost everyone around me was eating the straw hat omurice. I normally don’t care too much what I order in Japan because the food is usually good no matter what, but in this case I knew I’d made a mistake. Ah well, the strawberry cake made up for it and I just loved the Totoro flag. I’m sure you will get your chance to go someday, I think you would enjoy the museum as well. omg that strawberry cakes look beautiful. I think it tasted even better than it looked! Based on just the name of the cafe, I thought it was inspired by One Piece! Not quite I guess haha, but this place looks awesome. Oh that omu rice was the cutest, I hope you will enjoy it! I’m hoping to revisit Japan in 2014 and try and get back to the Ghibli Museum as well. 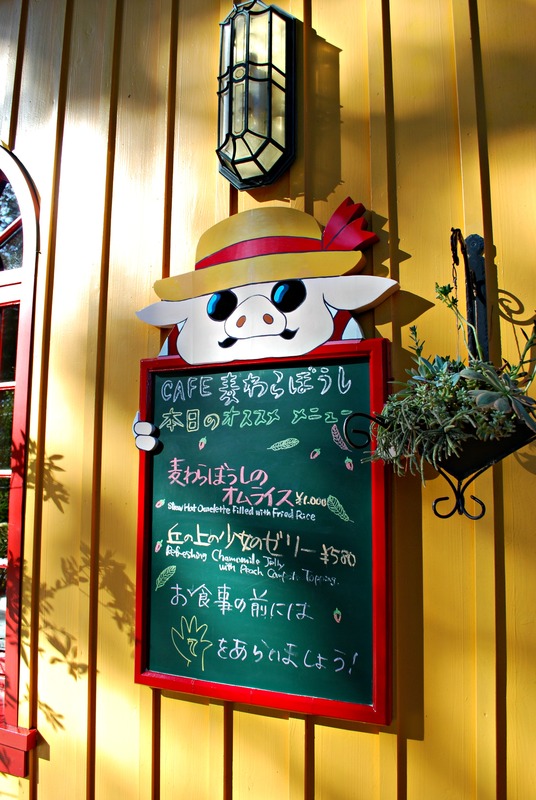 I really really want to go to the Ghibli Museum when I go and I’d heard of the restaurant but hadn’t seen any pictures or heard how the food was! It looks beyond amazing!!!! I think I’d be like the jittering chinese girls–totally fan-girling at every little cute detail! *sighs* Somehow, I have to get there!!! Don’t worry, time really flies and before you know it you will be in Tokyo visiting the Ghibli Museum for yourself! You will have such a fabulous time when you go, the exhibits were really wonderful. And the highlight for us was the short movie they showed in their little theater. It’s the only place in the world you can watch those movies so it was such a special experience. The menu at the cafe changes with the seasons so hopefully there will be something even better and cuter by the time you go. Make sure to look around and see what other people are ordering. I was so busy checking out the cafe’s decorations that I didn’t even bother to look at what everyone’s plates. 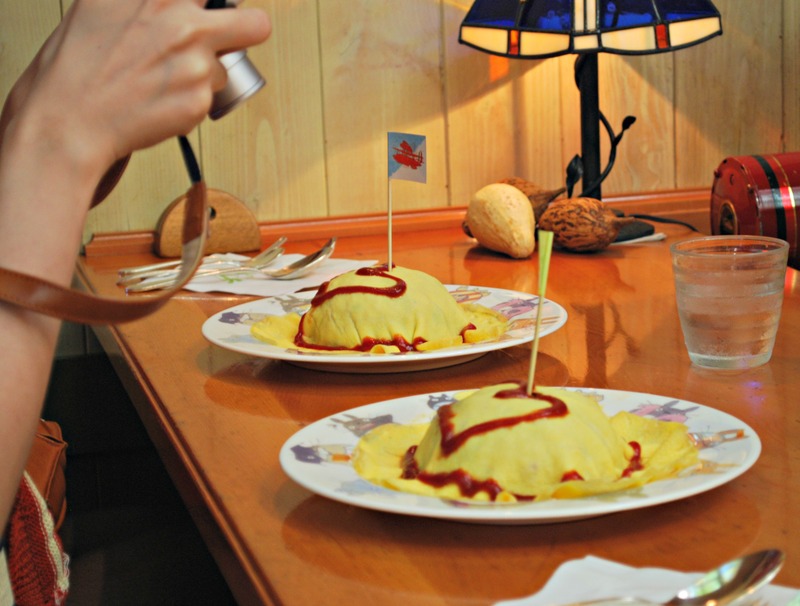 Or I would have noticed that 95% of the people had the omurice! The strawberry shortcake looks so good! Though the parfait did look better. Next time I go to Tokyo I will definitely make a visit to this museum and cafe!! Thanks for sharing this with us! It was wonderful getting to go to the museum and cafe. We’ve always wanted to visit but never had the time until our last visit to Tokyo. I hope you will have a fabulous time when you make it there. Nice pictures. I didn’t have a chance to go inside the cafe when I visited the museum 3 weeks ago. Full house. Thanks so much for your comment! Yes, I think the cafe is usually pretty busy and other posts I’ve read on it always talks about a wait. We had a lot of fun eating there, I just wish we’d ordered the omurice, but the strawberry cake made up for it, it was so good! Aw thank you! I hope you’ll be able to go to Japan someday as well, I think you’d love it there! Oh that’s wonderful to hear! I loved our visit to the Ghibli Museum. The best part (even better than the cafe) was getting to watch the short movie in their little theater. It was called “The Day I Raised a Planet”, so charming and you can only watch it at the museum so that made it extra special. I forgot about the Ghibli Museum. Told my wife we’re going the next time we’re back in town. Great photos! I actually kind of forgot about the Ghibli Museum myself until this last visit to Japan. We had a really great time there, the whole place has such a magical feel to it. And watching the short movie which you can’t see anywhere else was really wonderful. Lucky! 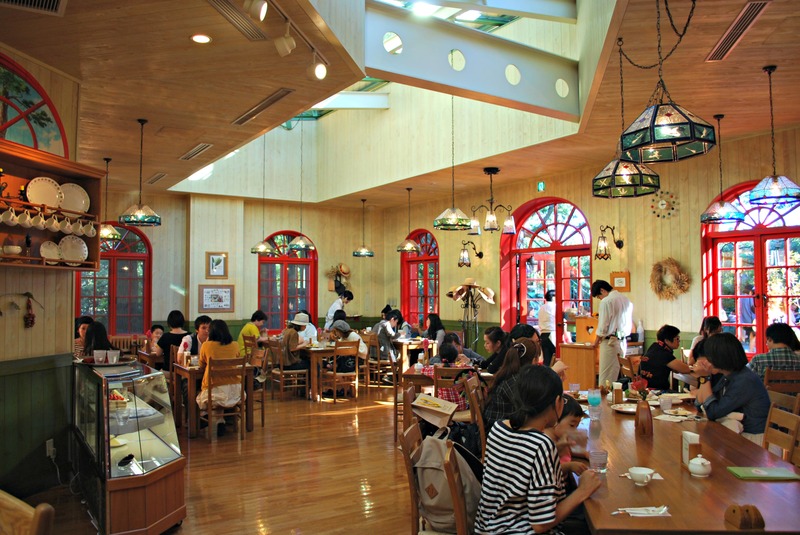 I would love to go to the Ghibli Museum (and cafe!) someday. It’s a wonderful museum, it really celebrates the magic of Miyazaki’s movies. It took us many visits to Japan to finally get there but we’re so glad we went! Thanks so much for commenting.